Here is our Quarterly Global Geopolitical Macro Outlook, it focuses as usual on factors overlooked by consensus that could affect the Economy and Financial Markets. In June 72 years ago, the Allied Expeditionary Forces launched the invasion of Normandy from Britain, the only European power Hitler could not overrun. This month Britain may again decide the future of Europe. Indeed, the British people are possibly the worst nightmare for EU leaders: a band of people renowned for their ability to stand up to overwhelming threats – just as they did during the Battle for England in 1940. As we pointed out last year, British leaders and businesses are risking a disastrous backlash by focusing on what the UK would lose if they exit. The focus on the economic impact does not address the fact that millions of Britons dislike the path their nation is on, have serious doubts about the competency of the EU (Yugoslavia, Debt Crisis, Greece etc.) and are still struggling to digest the waves of massive migration of recent decades. Most Britons favor European cooperation, but the focus on GDP, corporate profits and EU funding in the debate did overshoot. UK GDP recovery since 2009 has been stellar, but millions of Britons feel left out and that Big Firms are the biggest beneficiaries – not sharing their record profits with the middle class. They are also weary of greater dependence on EU subsidies. The threats by political & big business leaders now carry the risk of triggering that deep-seated distrust. Even if rejected, BREXIT is having a tremendous irreversible impact: First, Germany has begun to rearm, and many Western powers are following suit. Second, British leaders have seen the vengeful & to some extent ungrateful reaction by EU leaders to the news when the Leave Camp led in the polls. If there is peace & democracy today in Europe, it is thanks to the bravery & sacrifice of Britain in 1940 to stand up alone to a Nazi-occupied European continent. That opened the door for the U.S. intervention and the Russian counter-offensive. This is not simply history, 1’542 pilots & aircrew offered their lives to defend England against an overwhelming German war machine, so did over 20’000’000 Russians. Brussels threatening to be harsh on Britain after a BREXIT has shed light on the predicament of EU leaders. Good for Britain it didn’t respond at that level. I’ll finish this introduction by saying, “it would have been better for Cameron and the business lobbies to address peoples’ hearts and emotions, rather than their pockets. The case for the UK in the EU could have been made in a more positive and broader fashion”. Britain’s Military relevance has been overlooked in the current BREXIT discussion, but it is the main reason why EU leaders are in state of great anxiety. Without Britain the current EU will collapse. Without the EU, Britain is likely to go through a painful adjustment period, but will flourish thereafter. At the minimum, it will outperform the EU, just as Switzerland – an open competitive economy – has outperformed the dysfunctional EU since it voted to stay out. Key German business leaders think strategically and see the need for Germany to join forces with Britain and to deepen cooperation with Russia. British voters, beware of the advice by prominent economists, professors and business leaders: The overwhelming majority of such experts diagnosed with great detail in the 1990’s that if Switzerland doesn’t join the EU, it would impoverish within 10-20 years. The opposite took place. Most economists and Big Business leaders are not independent nor neutral in this matter; they have a massive collusion of interests. Their institutions are among the greatest beneficiaries of the EU. If British citizens decide to leave the EU, Britain is most likely to negotiate better Bilateral Agreements than Switzerland. Britain’s importance for Europe is undeniably greater than Switzerland’s. Britain has the advantage that it can use the Swiss-EU bilateral groundwork and adapt it to its needs. Yes, Britain can choose & negotiate its terms; it may not be the language powerful unelected bureaucrats like to hear, but that will reflect the strength of a geopolitical and financial power. That which markets overlook, has the biggest impact on them: in the BREXIT discussion, media and politicians have directed attention away from the geopolitical importance of Britain for Europe. Most experts and investors are taking the view that BREXIT will be rejected and therefore everything will go back to normal. It won’t. Experts have focused almost entirely on the short-to-medium term economic & financial impact of a BREXIT. But what the BREXIT discussion has exposed is the tremendous geopolitical strategic importance of Britain for the European Union. A sovereign free market economy & democracy are the foundation for economic prosperity, not Trade Deals. Most of the geopolitical & military discussions triggered by the BREXIT referendum over the past 18 months have been kept secret. The BREXIT discussion exposed the horrible military vulnerability of the EU and her dependence on Britain and USA. Without Britain, the EU cannot properly protect her maritime routes, nor can it project power in accordance to her economic weight. Economic power without credible military deterrence is a naive dream, ask China about it. While EU leaders were telling their citizens that Russia intends to invade Eastern Europe, China was quietly achieving Nuclear First Strike Capability against the West. That is why the U.S. Navy has been ordered to simply monitor China’s assertive expansion. EU military forces are at brigade-strength and suitable for peace-keeping operations only. Even 72 hours into a state of emergency and war France could barely mobilise 3’000 soldiers. That exposed the level of preparedness of EU bureaucrats and their utter lack of strategic foresight. Britain’s geopolitical cards are growing: The new British Queen-Elizabeth-Class Aircraft Carriers can only be rivalled by the Nimitz Class Carriers and Ford Super Carriers of the U.S. Navy and will add to the British Power Projection. The reliance of the EU on British military security will be greatest during 2018 to 2023. EU states rely on the NATO alliance to mask their military demise, but resistance to the current dysfunctional NATO is growing in the U.S. Congress. France’s one superb Carrier Group is of limited help, since it has to sit in the docks for considerable time. The EU needs a minimum of two advanced carrier groups to be taken serious internationally and to provide aid to the USA in case it is needed. The EU will become a geopolitical “dwarf” without Britain. And that will accelerate its demise and break-up, which would be a blessing in disguise. A BREXIT would allow Germany to successfully demand a renewal of the European Integration Project. Our research shows, only ten EU members are fit for a European Economic & Political Federation. France is – despite its technological prowess – not one of them. Another case we are making in this outlook is that even if BREXIT is rejected, it is already having an irreversible impact. One that will only increase in the next 5-7 years. Because of the possibility of an isolation of Britain from the EU and of the USA from NATO in the future, Germany has decided to rebuild its dismantled military. A minimum of USD 160 Bn will be invested in the next few years to rebuild the once powerful Bundeswehr (German Armed Forces). As the BREXIT movement gathered momentum in 2015, the German Defence Ministry gave orders to accelerate the rebuilding of the Military. A gigantic undertaking that will take until 2023. Stealth super submarines are the quietest way to project power & security along Maritime Routes that are vital for European Trade. Krupp has advanced that technology. Economic and political experts err when they say, everything will go back to normal on Friday morning at 3 AM when the 1st official projection of the rejection of BREXIT will be announced in Manchester (UK). The strategic & historic move by Germany to rearm will not be revoked by the BREXIT outcome though. After having monitored the relentless EU expansion into the former Soviet Space (Reagan-Gorbachev’s buffer) and the impressive rearmament and re-grouping of Russian Armed Forces into four combat armies, German strategists realised, the current dependency from Britain is a major risk for Germany and the EU. Despite years of diminishing & dismantling their militaries, Western nations responded quickly to the German move. Western Powers have begun to rebuild their militaries as a response to the re-militarisation of Germany and China’s achievement of Nuclear First Strike Capability. Officially they speak of Russia as the main threat, but that is to some extent calculated misinformation. Since President Obama ordered US Strategic Armed Forces to be shifted away from Europe back to the Homeland and the Pacific Theatre, EU leaders have been trying to encircle and provoke Russia – successfully so – in order to make the USA reverse the pull-out and commit more forces to the European continent. The re-armament of Germany, followed by Britain and France is a reality accelerated by BREXIT and China’s unchecked Nuclear Capability. Chinese land-based and submarine-based ballistic missiles are aiming at Western & Russian cities and command centres. Even the U.S. Congress is in the process of reversing the military shrinking process ordered by President Obama. In fact until Germany, France and Italy have rearmed themselves to a healthy level, the importance of the British Military and the superb strategic location of British Overseas Military Bases will be elevated for the next 7 years. Which could even add strength to Pound if circumstances lead public attention to this topic. Following are some specific Brexit and EU-related research topics overlooked by consensus and mainstream media .. Given rising geopolitical threats, military security will have an impact on Currencies and Interest Rates. As the EU vulnerability becomes visible, the Euro will experience substantial downward pressure. At this moment the Swiss Confederation is still in a state of denial and has not reversed the dismantling of the Swiss Army. This could have a negative impact on the Swiss Franc and policy options depending on the security arrangements with France and Germany. What will they demand in order to protect Switzerland? Taking the above into account within our Global Macro Outlook, we can expect tensions and uncertainty to rise just as economic growth and inflation in key economies will deliver positive surprises over the next 7 years. After 2023 – paralleling the assertive Rise of Turkey and its out-maneuvering of Europe – the process will go into reverse and economic headwinds will prevail. Additional productivity improvements may then come from Africa and technological innovations. It will be a disconcerting situation to many that expect heightened uncertainty to lead to recession. While the world faces multiple challenges and the risk of financial crises, the recession likelihood in the short term is overstated by mainstream consensus. While most strategists hold their breath and wait for the BREXIT outcome, I’d like to focus on the Big Picture and elaborate a bit more on two not so unlikely events: the UK exit from the EU and the EU-association with Turkey (or entry through the back door). Both or either of them would steer the EU in the same direction. It is no coincidence that Turkey and BREXIT are on the table almost at the same time. A major aspect consensus overlooks is the great geo-strategic importance of the UK for the EU. 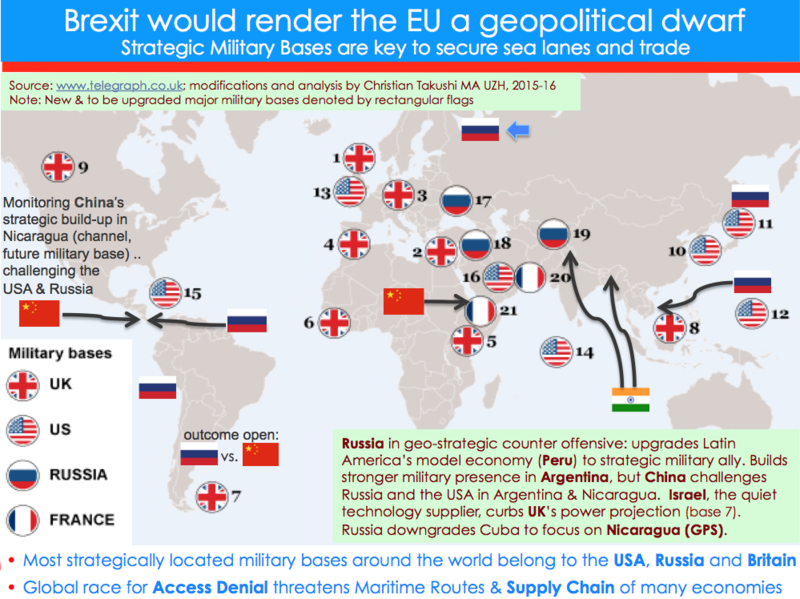 Britain’s 9 strategically located military bases around the world provide Power Projection and help secure the Trading Routes on which European economies depend. Most take it for granted, but increasingly even the USA is being denied access to sea routes. Access Denial is one of the growing threats to Global Trade and the World Economy. The growing vulnerability of the maritime routes is one of the reasons why I see a risk for business models dependent on trading mass merchandise with limited added value. They could not pay the real cost of the sea pollution they cause nor digest the rise in insurance & transport costs. Figure 2 is a Geostrategic Chart we upgraded to visualise the research we’ve done in recent weeks: As you can see, old and new powers are building military bases to project power over key maritime & terrestrial routes. India is challenging China’s Silk Route, while Russia is challenging China’s South China Sea dominance. Likewise, China is challenging Russia’s plans in Argentina and the US Panama Canal with a giant Nicaragua channel (officially in private hands). The British military bases are not simply superbly located and useful in case of war. They project power and deny potential disrupters access to strategic passages for trade. That provides the security environment for economic growth and low costs of transport & insurance. Over the past 18 months consensus has focused almost exclusively on the financial and economic consequences of a possible BREXIT. Nevertheless, it is the geopolitical framework (security via credible deterrence) that lays the foundation for economic growth. Cut off from Russia by the recent Ukraine conflict, German strategic advisers are deeply concerned about the possible loss of Britain’s military shield. This at a time when a growing number of US leaders are quietly questioning the U.S. role in NATO. After the purge of dissident minds in the U.S. Armed Forces over the past 7 years, top-level U.S. officers hesitate to voice any doubt about the official U.S. Policy. Nevertheless, the disquiet about the increasingly asymmetric NATO Alliance among US generals is growing: The EU expanded aggressively, dismantled its military forces, .. takes risks and the USA may have to go to war to defend her. Worse, if attacked, the USA cannot expect any significant military help from an unprepared EU. The EU cannot even defend herself. As we said last year, important EU military divisions exit merely on paper. The 2nd largest world economy has only brigade-size units, fit only for peace-keeping operations. Over the past century the USA had to intervene in Europe several times: WW1, WW2, War in Yugoslavia and recently Ukraine, the latter one exposing the EU’s utter lack of a sustainable energy strategy and back up. Just as the USA had to intervene after 7 years of Chamberlain’s style EU-appeasement in Yugoslavia, the USA had to downgrade key allies to secure a Deal with Iran and gain access to Iranian Gas & Oil as Energy Back Up for Europe. The EU’s negotiating position versus Russia has been greatly strengthened since Obama signed the US-Iran Deal, making great concessions to Iran. As you may remember, soon after the EU’s dependence on Russian Gas was exposed, we predicted a deal with Iran would soon materialise. Our strategic assessment is unchanged, the US-Iran Deal has set the Middle East on course for at least two wars. And one of them may very likely see the use of ballistic nuclear weapons. Europe’s lack of strategic foresight has come at a tall price. The Nuclear Security over Europe is fading away. Not only does the West underestimate how much it has humiliated and encircled Russia since 1999, the new Iranian and Saudi ballistic capabilities will be able to reach Western Europe by Spring 2018. And, believe me, accuracy is not their top concern. All these strategic failures will compound the convergence of unaddressed structural flaws, external threats & risks, overwhelming individual European Nation States. At the height of the coming super crises, European nation states will surrender sovereignties to a European Federation in return for bail-outs and security. That Federation will morph into a Super State to counter-balance the move by the rising Super States on other continents. Because of the growing convergence of global geopolitical forces and the declining economic weight of the Eurozone, European states will be forced to use the aftermath of the BREXIT vote to re-group and steer the process towards a more functional European Federation. But as the past 17 painful EU years showed, without a functional core, any new structure would fail as badly as the current one. We have analysed the current EU members and found the majority need a high level of protectionism, thus unfit for the rigors of global competition. There are nevertheless 10 EU members that are competitive and whose socio-economic systems are compatible with one another (see figure 3). Germany and Britain fit in there. That is why the exit of Britain would be a deathblow to the current EU. A union that portrays to be driven by France and Germany (the latter a reluctant leader), but whose economic dynamism is spearheaded by Germany and Britain. Britain has de facto been the biggest pro-reform partner and contributor to Berlin’s efforts to make the EU survive and prosper. If Berlin has to struggle in agonising anxiety over recent months ahead of the BREXIT referendum, is because it gave in to diplomatic pressure and lacked the strength to deal with France and Britain according to their performance and contributions. Without Berlin’s paralysis, BREXIT would have never become necessary. Berlin’s worst strategic weakness is in fact its excessive need to be accepted by everybody and endlessly worrying about what others will say about it. Historians speak of Germany being held hostage by its past, unable to lead and take tough decisions. Reason, why many dynamic nations in Europe will quietly consider joining or seeking cooperation with Britain if it exits the EU. Berlin is simply too afraid of annoying Paris or making mistakes – and that is not even helping France. Britain was rarely allowed to shape the EU agenda meaningfully, despite it being the most dynamic power alongside Germany. Now, whatever the result of BREXIT, Britain is exceedingly divided and distrustful of the EU. Below are the ten EU members we have found to be fit to join a far-reaching economic-political federation. Most of these will be at the core of any successful European Integration Process. They are compatible and competitive enough that put together they could be successful with each nation keeping its own currency. An own currency forces every member state to keep its finances healthy. Cheating doesn’t help. With a premature Monetary Union you need an army of bureaucrats to oversee the members’ finances; the problem is those unelected & unaccountable bureaucrats frequent the same restaurants, are fallible and end up exchanging favours to cut corners – just as the EU did to rush 15 nations into the EU. There is nothing like the efficiency and transparency of National Currencies and Currency Markets; markets simply limit the power of governments and corruption. A nation’s currency falls to the level where all economic factors are in equilibrium again. Reason why European leaders wanted to remove the national currencies prematurely by introducing the EURO. It is no surprising EU leaders have been waging a war against traders, specially currency traders – exposing their shortcomings, but never admitting their vital contribution to efficiency and transparency in resource allocation. Had the EU stuck to these ten nations during the first 20 years, it could be now preparing a Monetary Union and the careful accession of other European nations that have met the criteria for at least one full business cycle. Something that needs independent auditing and transparency – just the opposite of what the EU stands for. First things first. Monetary Union should be the last step in a cautious & long integration process. This means once nations have proven fit and compatible; and their citizens able to adapt and accept the rigors of competition & reform. Otherwise they will rush to join for the handouts and protection from outside competition, today’s flawed EU. If Britain exits, EU leaders will regret not having treated Britain according to its real power, performance and contribution. Without Britain, the balance in the EU will tilt sharply in favor of Protectionist-Deficit Spending-Unfit Economies, and Germany won’t be able to foot the whole bill. BREXIT would be a blessing in disguise, forcing the remaining members to face reform or a break-up. So far, German citizens have been grudgingly willing to pay for the EU, but over the next two decades the “Old” Age Dependency Ratio in Germany will deteriorate dramatically from currently 32 to 50, triggering an explosion of the costs for the elderly. Germany faces a bill of USD 25 Bn to cope with 1.4 million refugees and USD 160 Bn to rebuild its dismantled Bundeswehr (Armed Forces) over the next 7 years. Without the dynamic & fast growing UK economy, German taxpayers will revolt rather sooner than later. Trapped in a Euro-centric logical-linear way of thinking, mainstream consensus focuses on avoiding Turkey’s membership instead of Turkey’s influence and the eventuality of a EU bound to Turkey. This is where our broader logical-linear (Western) and circular (Oriental) approach pays off and leads to different conclusions. European analysts underestimate both the increasingly assertive geostrategy of Turkey to advance its influence during 2015-2023 and the massive confluence of external factors that will force the EU to embrace Turkey. We have warned in recent years that Turkey is outsmarting the EU with geostrategic foresight. The timing of the EU Migrant Crisis was no coincidence. Ankara has out-maneuvered Brussels into a corner where the EU can only lose or give in over time. Why have we expected an emboldened Turkey during 2015-23 projecting power way beyond its economic weight? Two main reasons explain our non-consensus assessment. First, Turkey is an Oriental nation where the “circular” way of thinking and attention to Lunar Calender events (religion & tradition) for strategic decisions is particularly strong. For two decades now Turkish superb geostrategists have been preparing the nation for two major anniversaries. In the Oriental world Honor & History rule; especially when they converge and are confirmed by major lunar events. This releases a “sense of mission” Westerners can rarely grasp, at their own peril. From Turkey to Japan life is a cycle, life & death recur and historic moments return. Turkish leaders are preparing the nation to meet these historic “appointments”. Ankara wants to play a decisive role in returning Jerusalem to the Arab world – also to finally earn their acceptance – and to regain its influence over Europe. Binding the EU to Turkey by 2023 would be a historic victory. Four rare lunar events that occur only every couple of centuries rallied the fervor of Islamic religious leaders in Turkey and the Middle East: Four Blood Moons (consecutive Full Lunar Eclipses on Jewish High Feast, Super Moon) during 2015-2016 pointed to Israel’s vulnerability. A reason why many Israeli religious leaders insist on a strong leader, Mr. Netanyahu. Thus, the period of 2015 to 2022 is one in which Turkish, Iranian & Arab leaders will be unsettled and emboldened. The problem in the Muslim-Arab world is that Turkey, Iran (Shias) and Saudi (Sunnis) all claim to be divinely appointed to lead the next Caliphate, one that shall rule the world with an iron hand. Second, all the above would have limited upside if the USA would oppose it, but destiny has been on Turkey’s side. President Obama has reshuffled the Middle East landscape and downgraded former strategic U.S. Allies (Saudi Arabia, Egypt and Israel) in order to embrace Iran & Turkey. This explains why he singled out ISIS (Daesh), but works together with Iran-backed Islamic groups incl. the Moslem Brotherhood. President Obama is helping Europe while advancing a vision close to his heart. Iranian Oil & Gas cannot reach Europe (Romanian hubs under construction) without passing through Northern Iraq, Eastern Syria, and Turkey. This helps explain the wars in Iraq and Syria, 2nd reason; the Middle East Economy could experience a powerful expansion if pivoted on Turkey-Iran, instead of Egypt-Saudi Arabia. Of course if the region can avoid a devastating war. President Obama wants both economic powerhouses to rise without war between them – he understands a region of distrust needs that balance. Turkish and Shia leaders see finally a divine confirmation of their appointment with history in the current US President himself: the son of a Muslim father. One eager to undertake a risky reshuffle of the Middle East to allow the region’s economic rise. Ideologically obsessed, Republican leaders resisted most of Obama domestic policies, calling him a weak president. But in fact Obama has outsmarted them – left free to reshape US Security & Foreign Policy, he advanced his greatest ideas for the world and the Middle East in particular. This is the backdrop for a resurgent Turkey, one Europe should brace for. Turkey may be chewing more than it can digest, but Ankara’s geo-strategists have clearly outsmarted Brussels’ administrators. The President of the United States (POTUS) is in the process of massively intensifying the campaign against ISIS (DAESH) and the involvement in the Middle East. After having ordered a very “light” campaign against ISIS for years, forbidding Central Command to launch massive strikes against ISIS’ oil assets, oil convoys, and strategic supply lines, POTUS has ordered the near-full combat engagement of the U.S. Fifth Fleet Aircraft Carrier Group. Another Carrier Group is on its way (24/7 sorties) and a third one is being readied. There is a qualitative change in US military posture in the Middle East and Asia. I believe it will be short-lived for the June-October elections period, and I see the USD beginning to reflect this more assertive U.S. Power Projection. A big stretch for all US military branches though, since POTUS degraded their strategic capabilities. We see that in the thin US Military presence in key bottlenecks of maritime routes, where the USA is facing Access Denial. Expect important Allied military advances on the ground in Iraq and Syria over the next few months to nearly coincide with US Presidential Campaign battlegrounds, and a wave of attention by mainstream media, much of which has mobilised in support of POTUS and Mrs. Clinton. It is clear to us that POTUS is trying to alter the widespread perception of a failed US Middle Policy and protracted US weakness. This could neutralise one of Clinton’s key weaknesses with the US public: the failed Middle East Policies of the Obama-Clinton team. I finalise with a warning that the geopolitical landscape is very fluid. The converging Orlando terror attack, the latest Paris attack and the murder of a British MP could affect the Brexit vote. Is it all decided and BREXIT averted? Not quite, yet, As voters recover from the shocking death of a cherished Labour MP, the failure by current government leaders to speak openly about sovereignty, Islamic radicalisation & security is likely to sway undecided voters to consider the BREXIT. PS: In our Quarterly Outlook (full text) we give strategic advice to investors and also address the significance of NATO holding the largest comprehensive combat maneuvers of recent decades in the Far East of Europe. NATO is additionally building new permanent military presence at two strategic spots, thus breaching the security treaty with Russia. Moscow may threaten to exit the START II Treaty that provides Ballistic & Nuclear Security over Europe. General Disclaimer: Global Macro and Geopolitical Analysis are highly complex and subject to sudden changes. No analytical method is without certain disadvantages. We may change our 3-pronged outlook within less than 3-6 hours following an event or data release. Global macro analysis can be extremely time-sensitive and the first 24 hours after an event are critical for the response of a corporation, investor or pension. Only qualified investors should make use of macro reports and treat them as an additional independent perspective. Every investor should weigh different perspectives as well as “opportunities & risks” before making any investment decision. Not all our reports, research and intelligence is published here. Only our clients have the full and immediate access to it. What we release here is delayed and adapted. The research & views we post here for public access are aimed at fostering research exchange (to improve our assessment) and helping decision makers adapt their long term & strategic planning to changing realities, not for short term decisions. If you are not a qualified or professional investor, you should get professional advice before taking any investment decisions.